Celtic manager Neil Lennon has derided the SFA’s “trumped up” charges against the club and captain Scott Brown following the ugly scenes at the end of Sunday’s 2-1 victory over Rangers at Parkhead. Both clubs have been issued with notices of complaint for failing to control their players in a melee at the end of the game, when Brown celebrated in front of the travelling support and Andy Halliday led a posse of Rangers players who raced over to confront the 33-year-old. Lennon argues that the hosts are not guilty of any offence, other than preventing their opponents from getting to Brown. “I think it’s a massive deflection from some people,” he said. “We have a great disciplinary record at this club. In the last seven years we’ve had the best-disciplined team in the country five times and been runners-up twice. “Our players handled the occasion very, very well and theirs didn’t. People are trying to drag Scott into this but he handled the game as well as anyone, even though he was elbowed and pushed in the face. Brown has been cited for “not acting in the best interests of association football” and Lennon admitted he did not know exactly what that meant. He added: “We’re all football men and we can maybe surmise but I won’t know until I see it in writing. “From what I gather, you can’t be punished retrospectively for gesturing – and what Scott did wasn’t even an abusive gesture, which I’ve been guilty of myself in the past. “What he did was raise his hands aloft… what a bad boy that is. [Rangers’] Josh Windass wasn’t done for something similar against Partick Thistle last season because seemingly it’s no longer an offence so we’ll need to get some clarity. “For me, it’s like a trumped-up charge to make it look as though they’re trying to even things up. It’s a piece of nonsense and we’ll defend Scott to the hilt. I’m not having my captain elbowed and punched and then made out to be the villain of the piece. “How’s he been about it? You know Browny...he just shrugs his shoulders and gets on with it. 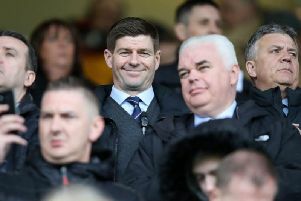 When our boys lost at Ibrox [on December 29] they had to take it and they did. They were straight up the tunnel and accepted the defeat. “There was plenty of goading, if you want to call it that, going on then but they just brushed it off. We accepted the defeat for what it was. [Rangers] knew they hadn’t played well [last weekend] and they reacted differently. Celtic host Livingston on Saturday and know that victory would secure the title should Rangers lose at Motherwell on Sunday.